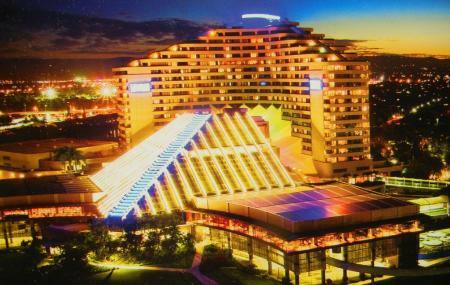 Jupiters Casino is a premier entertainment destination located near the Nerang River, on the Gold Coast. Opened in 1986, it was Queensland’s first Casino and has undergone some major renovations and makeovers over the period of time. The Jupitrs Casino compound consists of 8 bars, 7 restaurants, a theatre, health spa, and a gym. There is a monorail as well that connects it to the Oasis Shopping Centre across the road. 70 gaming tables including Blackjack, Jupiters21 and Roulette. State of the art theatre – Musical concerts and other events are organised here. The rooms here get full on weekend and major celebrations, it is advised to reserve your rooms in advance if you plan to stay at the Jupiters Hotel and Casino. By Bus to Victoria Ave at Broadbeach Mall. Love this? Explore the entire list of places to visit in Broadbeach before you plan your trip. Fancy a good night's sleep after a tiring day? Check out where to stay in Broadbeach and book an accommodation of your choice. How popular is Jupiters Casino? People normally club together Paradise Point Parklands and Robina Town Centre while planning their visit to Jupiters Casino. Stayed 2 nights in an extremely modern, clean and comfortable room. Fantastic views over Broadbeach. Plenty of good priced restaurants to choose from as well as the casino to play at. The upgrades have really rejuvenated this hotel and I would not hesitate to stay again. Why 3 star..... the upgrade is amazing and the starlet are great with a clean and safe environment... the problem I have is the vibe... I've been to Vegas and they have proper night venues or at least up beat music to add an epic vibe... I understand why the Star chooses mellow beats... but not even up beat house music is played... unfortunately it will be the Stars undoing. And you can see that already after 12 months... the Garden dosent have the buzz it did and if you don't give that fun draw card and bore people... then you loose the customers all from the mellow vibe. We have eaten in the restaurants here whilst visiting friends who were staying in this hotel.Lots of eateries and cafes within the hotel. We saw their room and it looked very nice. They seemed happy. Very centrally located. Short distance to Pacific Fair and Broadbeach. The Casino has recently been revamped to give it a more modern look. There is a great selection of restaurants and bars to choose from, there is something for everyone. I enjoyed dining at the Harvest Buffet restaurant, there was an amazing selection of foods to choose from. The casino is nice and quaint with clean facilities. Their hotel rooms are nice and comfortable and the food options are really good. I would recommend the Harvest Buffet for a hardier meal.